If you look at the picture, I’m not sure who would’ve had the worse experience. Though I can tell you right now, no matter where you’re reading this post, you would have heard me screaming. Spiders get a bad rap. Because they’re small, have eight legs, and still don’t have a Pixar movie made about them, people are terrified of them. 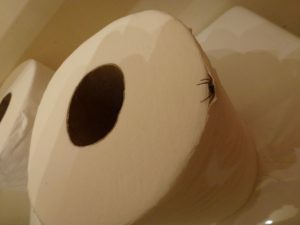 Although the majority of their bites cause little more than an itchy pimple, most people would rather commit treason against their country than share a room with a spider in it. However, without spiders, we humans literally wouldn’t exist. It is spiders, in fact, that kill off the flies, mosquitoes, and buzzing insects that would otherwise overpopulate the earth, spreading disease and decay and ruining picnics everywhere. But every time I share this fact with my sister, she assumes I’m just volunteering to kill the spider in the bathroom. However, I couldn’t even tell you the last time I killed a spider. Always approaching them with cup and paper, I respect our miniature guardians and rerelease them into the wild. 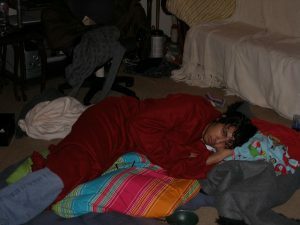 Even on the fateful night of June 17th, 2009. Laying on my bed in the basement, I felt a little tickle on my shin. Attributing the sensation to an unauthorized movement of my brambly leg hair, I dismissed the thought that a creepy-crawly could be creepily crawling across me. But because I’m an undaunted male, or more accurately, because it seemed like too much work to locate him, I passed out with him in the vicinity. Scrabbling deeper and deeper into my ear canal, his fast legs picking and digging, was the spider. Needless to say, I figured my best tactic for extracting the creature was to spread urine across my boxers and hoarsely scream monosyllabic nonsense. However, not even then, in my fit of psychotic fear, did I kill the spider. An actual photo from that night (Mom was awake and found it hilarious). Notice the jeans for extra protection. Though I did spend the rest of the night upstairs on an island of pillows and blankets with a flashlight and a cup. At the age of nineteen. P.S. Want to hear another of my spider encounters? Cuzzzzzz, you crap me up and I’am not kidding!